After Warsaw in 2017 and Milan in 2018, Barcelona will be the host city for the Best Chef Awards 2019, on the 23-24 September. 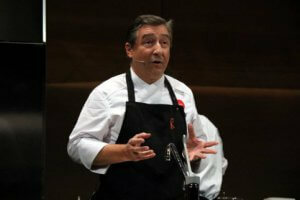 After Girona-based chef Joan Roca brought home the top prize from the first two editions of the worldwide culinary awards, this autumn the competition itself is coming to Catalonia. On the menu for the two-day cooking convention are a conference on ‘Food Meets Science’ and a gala-style ceremony, where winning restauranteurs in a range of categories will be revealed, the main course comprising the pronouncement of the top chef in the world this year. The awards process has been streamlined to comprise a ‘Power 100’ global ranking of chefs – chosen by industry professionals including chefs, sommeliers and food critics and photographers – which will form the long list from which the leading chef accolade will be selected. At the 2018 awards in Milan, Roca – whose three-Michelin star restaurant ‘El Celler de Can Roca‘ in Girona has twice been named the best in the world – retained the title he won at the inaugural event in Warsaw the previous year, while Spaniard David Muñoz kept third place. Roca will once again be one of the favorites to be named ‘Best Chef’, since he is recognised for his seemingly limitless innovation, serving up an ever-changing avant-garde take on traditional Catalan cuisine in surprise menus costing between €155 and €190 per customer.